On the eve of the Tal Law's expiration, the IDF is preparing to sort potential haredi soldiers ahead of their enlistment, Ynet has learned. For decades, the IDF would send haredi youths preliminary draft summons before granting them exemptions under the Tal Law. With the legislation set to expire on Wednesday, the IDF is gearing towards enlisting the ultra-religious individuals, starting with an extensive sorting procedure that includes a variety of tests. Officials involved in the process postulate that the development will lead to the recruitment of 7,500 ultra-Orthodox soldiers each year, a number three times higher than the current rate. 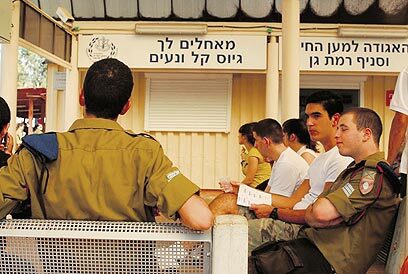 The expiration of the law, however, does not mean that the IDF will automatically stop exempting all haredim from service; changes to the current draft regulations are unlikely to go into effect before 2013. A team consisting of Defense Ministry legalists and IDF human resources officials has recently drafted an interim directive meant to allow legislators extra time to come up with an alternative to the Tal Law, after attempts to draft such legislation in recent months failed. "We are looking into the military's needs, and are discerning who is fit to be recruited while listening to the public's just demands for equality as well as the army and the haredim's demands," a senior member of the committee told Ynet. "(Defense Minister Ehud) Barak instructed the army to expand programs for ultra-Orthodox troops and to raise their salaries, which would replace the allowance that they currently get." The political system appears to have given up on the issue, tossing the hot potato over to the defense establishment. The Knesset went into summer recess, and Minister Moshe Ya'alon, whom Prime Minister Benjamin Netanyahu put in charge of dealing with the draft legislation, has recommended the immediate establishment of new programs for the enlistment of haredim, instead of waiting for a new law. On Tuesday evening, activists belonging to the Suckers Camp, a movement demanding the enactment of a universal draft, intend to give out flowers on the streets of Bnei Brak, a predominantly religious central Israeli city. The protesters also intend to distribute faux draft summons calling on potential ultra-religious soldiers to integrate within the army. "The duty of service in the State of Israel applies to all of us… This is a mighty opportunity for all of us to create one society, under on law, where everyone serves the state," the leaflets read. "No one wants to enlist you forcefully; no one wants to alter your way of life. We are brothers; we always have been and always will be." The National Student and Youth Council has also joined the battle, sending Netanyahu a strongly-worded letter urging him to enact universal army service. "Don’t let Zionism turn into cynicism," wrote Yuval Kahlon, the chairman of the council. "We don’t care about politics, we only care about how our lives will look like in a future State of Israel. How do you expect us to proudly fulfill our duty with this blatant discrimination tearing at our immense motivation?" Various protest movements are expected to join forces on the weekend to call for the equal sharing of the service burden and to express objection to the recent tax hikes. "The decision to favor the ultra-Orthodox interest over the general public's interest when it comes to the draft question, the failing attempts to dissolve Kadima and the outrageous financial edicts are like spitting in the public's face," said Idan Miller, who heads the unified protester camp. 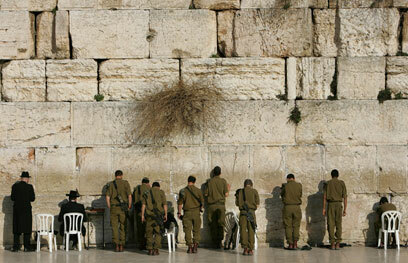 See all talkbacks "IDF readies to enlist haredim"